Old cast iron cookware can be super cool and decorative hanging on the wall of a country kitchen or cabin. But one of the best aspects of amassing a collection is actually being able to use it without worrying about damage, even collectible Griswold pieces. You can also "restore" it without worrying about hurting it if you happen to purchase a rusty old piece. In fact, some devoted cooks wouldn't be without a cast iron skillet in the perfect size for their family for everything from cooking up bacon to baking a batch of cornbread. Yes, cast iron is perfect for both the stove top and the oven, and you can even take it camping. Note: Some individuals shy away from using oven cleaner and other types of cleaning products when removing built-up grime and rust from their cast iron. These individuals recommend burying the pan in a wood fire to clean it. Not being familiar with this method, it is not being recommended here but may be worth researching further if a cleaner-free method is your preference. Wear rubber gloves and eye protection while cleaning cast iron since the methods listed here can require using products that may be harmful to skin and eyes. If you'll be using your pan for cooking rather than display, use a cleaning method within your comfort zone for food consumption. Begin by spraying the pan with oven cleaner and sealing it in a large plastic bag. After a day or two, take it out of the bag and scrub it down good with a wire brush. If all the grease doesn't loosen up right away, repeat the process concentrating cleaner on stubborn spots. If you have several dirty items, consider soaking them in a solution of one and a half gallons of water to one can of lye mixed in a plastic container. Allow dirty pans to soak for about five days, then remove the pieces and use the same brass brush method to scrub them clean. Removing mild rust should be done with a fine wire wheel on an electric drill. Crusted rust can be dissolved by soaking the piece in a 50 percent solution of white vinegar and water for a few hours. Once the pan's clean, begin the seasoning process by warming it in the oven for a few minutes then applying a little shortening, vegetable cooking spray, lard or bacon fat. Put the skillet back into a 225 F oven for 30 minutes. Remove and wipe it almost dry to eliminate any pooled grease. Place the pan in the oven for another half hour or so, completing the initial seasoning. The seasoning process will continue with use, especially if you use it to cook fatty foods (bacon, sausage, fried foods, etc.) the first few times it hits the stove. To clean after cooking, boil hot water in the pan. Let it soak for several minutes and then wipe dry with a paper towel. Reheat the pan and apply just enough grease to coat the surface before storing. Reserve the methods above only for cleaning cast iron cookware. Cleaning other types of cast iron in this way, such as door stops or valuable toys, may damage them. In most cases, oven cleaner will get your pan clean enough to begin seasoning it. Don't worry about scrubbing too hard with a wire brush when cleaning. You won't hurt a cast iron pan. Don't soak pans in a vinegar solution more than overnight without checking them. The solution may eat the iron over time. 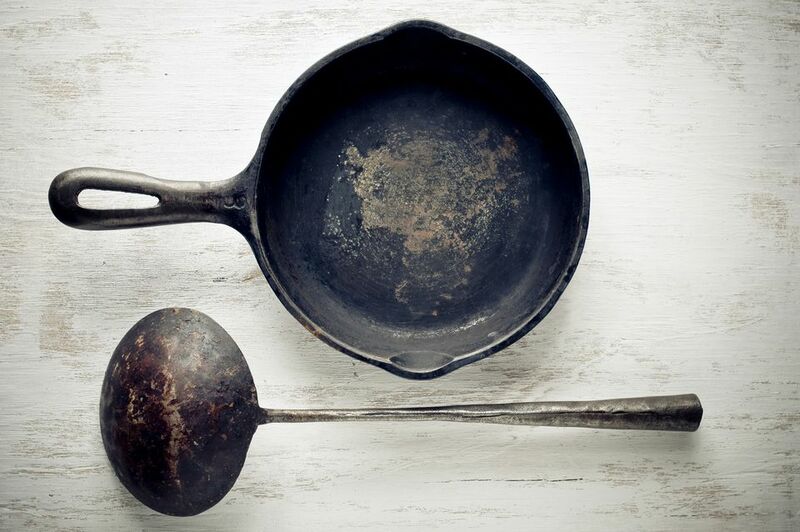 After cooking, do not use detergent or scouring pads to clean a cast iron pan since this will destroy the desirable seasoning that builds up over time.